Taplow Choirs is pleased to have a mixed voice Youth Choir which started in September 2006 and meets on alternate Saturdays from 4.30 pm - 7.00 pm. There are approximately 65 members - sopranos, altos, tenors and basses, and entry is by audition. The Choir already has considerable achievements and won the Outstanding Award at the National Festival of Music for Youth in 2008. It rates amongst the top youth choirs in the country and were Choir of the Year, Youth category winners 2008. The choir has also sung in the Schools Prom at the RAH. The choir usually meet in Taplow Village Centre Hall which is in the heart of Tapow village and has a free car park right outside the door. Taplow Youth Choir enjoys a partnership with the Gabrieli Singers and Players as part of its Young Singers Scheme. They will be involved with 'Gabrieli Roar' the next Young Singers project with likely performances on 16th February and 4th July. More information will be displayed as it becomes available. Paul McCreesh (Gabrieli director) and the choir directors and singers tell us more about the scheme, with footage from the performance and rehearsals of Handel’s Solomon (choruses), filmed at the Gabrieli Young Singers scheme launch event. An informal student-led performance of Moses Hogan's I'm Gonna Sing Till the Spirit, recorded in Tabor. A recording of Amanda McBroom's The Rose, performed by Taplow Youth Choir's female voices in the Korunni Chapel, Prague. As part of the Windsor Spring Festival, Taplow Youth Choir hosted a Youth Choirs concert on Saturday 22nd March in St George's Chapel, Windsor. The main work was a performance of the Mozart 'Requiem' but the programme also included Haydn 'Insanae et vanae curae' and motets and part songs from the individual choirs, from Monteverdi through to African music. Taplow Youth Choir sang Choral Evensong in prestigious surroundings. The 10th anniversary of Taplow Choirs was celebrated with a concert in Eton College School Hall on Saturday 28th June at 7.30 pm. All four choirs performed and a special Alumni Choir and a Parents' Choir were formed for one night only. A second CD by Taplow Youth Choir was made available in the early autumn of 2013, including some of the highlights of the year’s repertoire and the Venice Tour. The recording features music by Eric Whitacre, Moses Hogan, CV Stanford, Schubert, Carissimi, TL de Vitoria, and many others. Gillian was `elated' with the choir's performance, She said: "They were fantastic. For me the feeling of taking young people to that level is so great. They will never look back and they can go on to achieve great things." 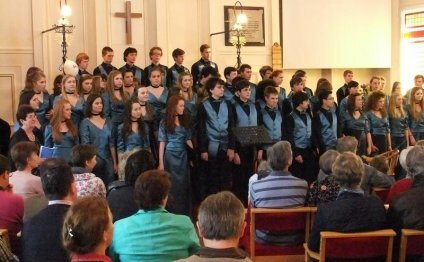 The mixed choir, which draws most of its members from Maidenhead, Slough and Windsor, boasts a long list of achievements despite only being set up in September 2006. Tours have included Amsterdam 2007, Estonia 2009, where the choir competed in the International Choral Competition and were awarded 2nd place in the Youth category and Catalonia 2011 where the choir sang to large audiences, received standing ovations and enjoyed wonderful venues, highlights being the Monastery Church at Monserrat and Barcelona Cathedral. The choir members were thrilled to sing in Elijah at the BBC Proms season in the Royal Albert Hall on 28th August, with the Gabrieli Consort and Players. In April 2013 a tour was made to Venice, and in 2015 the choir performed five concerts in Prague and the Czech Republic. The Rose - Amanda McBroom, arr Gwyn Arch. Taplow Youth Choir.